I am SOOOOO EXCITED to share this sneak peek with you guys! Those of you who started with us back when Fun at Home with Kids started in February of 2013 might remember me saying that my dream was to someday write a book. I can't believe it has actually come true!!! I wanted to write this post to tell you ALL about the book. Hopefully by the end you will be as excited about it as we are!! "Today, 8-18 year-olds devote an average of 7 hours and 38 minutes (7:38) to using entertainment media across a typical day (more than 53 hours a week)." At first I didn't believe that statistic, but then I realized how many screens kids can encounter in a given day: smart phones, computers, iPads, TVs...and it all adds up. I don't want anyone to be under the false impression that we are a screen-free family, or that I think that kids having any screen-time whatsoever is "bad". My husband works as a software engineer and I'm a blogger/writer - we definitely use a LOT of screens in our house. Though our little X doesn't get too much screen-time, S enjoys a TV show basically every day and knows her way around an iPad. 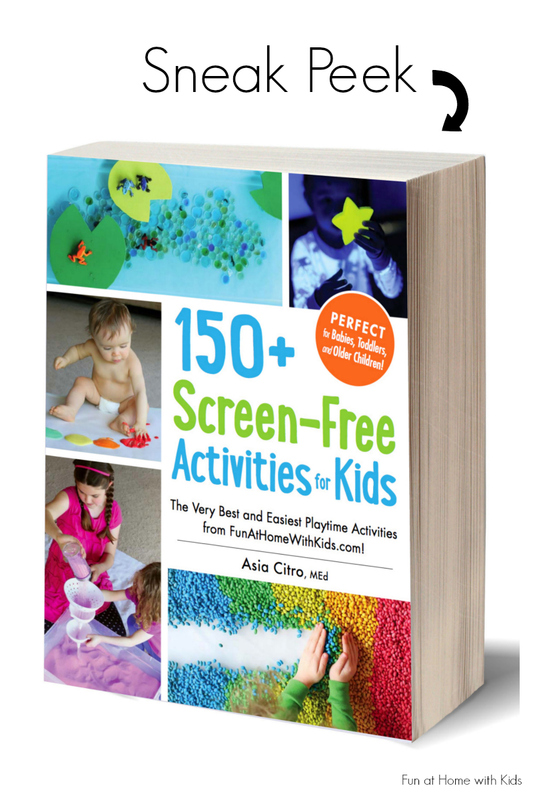 :) I like to think of the book's title as a reminder that in today's screen-filled world, we have to be conscious of how much screen-time (we and) our little ones are getting. 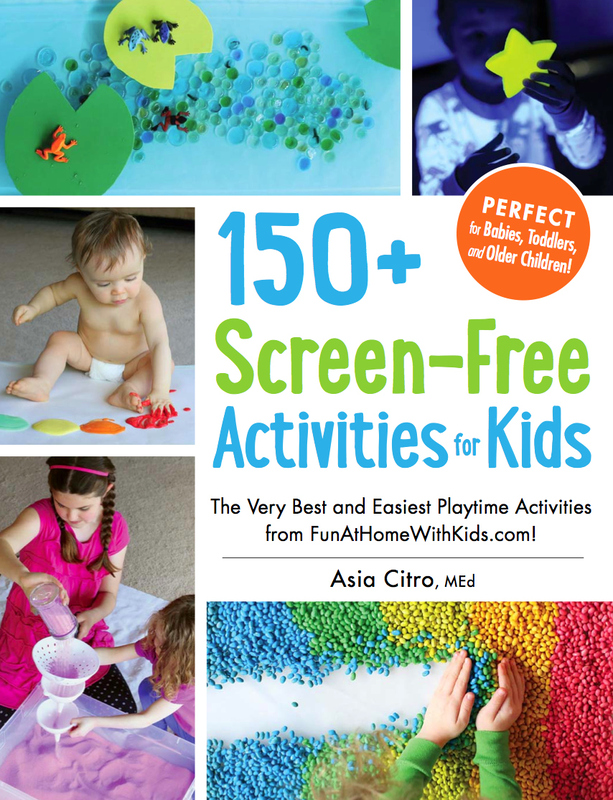 Over 150 of our very favorite and best activities for entertaining kids from babies on up to age 10 (though I'll just say that the activities don't stop being fun when you're 10...my husband and I still like them and we're in our thirties). I asked a lot of my good (and honest) friends what they did and didn't like about activity books and designed this book around their advice. Several of my friends said that when they get an activity book they don't know where to start - there are SO many activities to choose from, it's overwhelming. 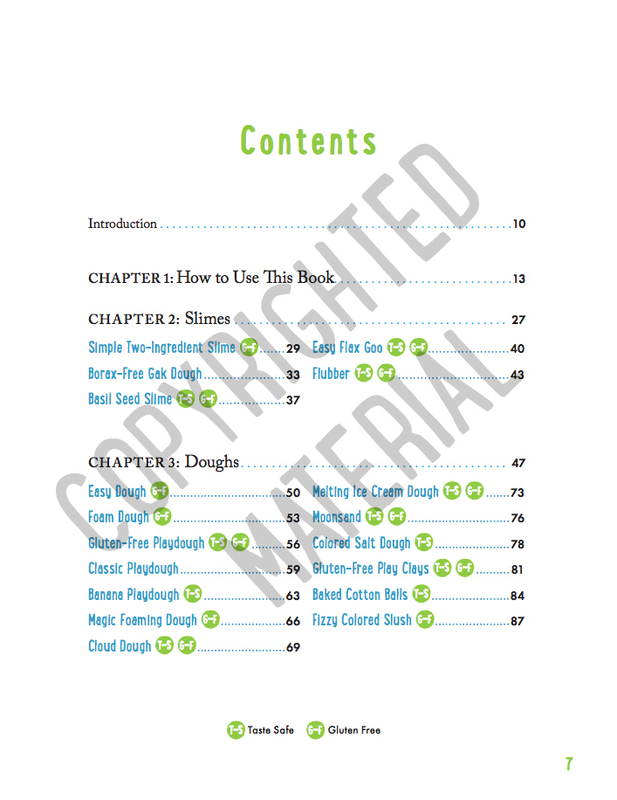 I designed my book so that activities that use a common ingredient or recipe are all grouped together. The simplest version of an activity or recipe appears first so you can get started there. Variations on that recipe/ingredient appear in a condensed form on the following page. 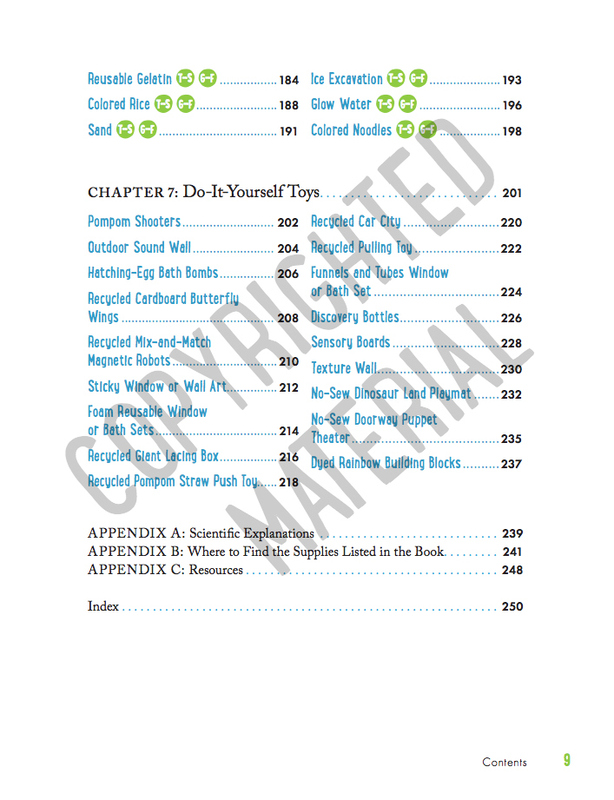 My hope is that this will make the book appear more do-able, even though it does contain somewhere around 180 activities. 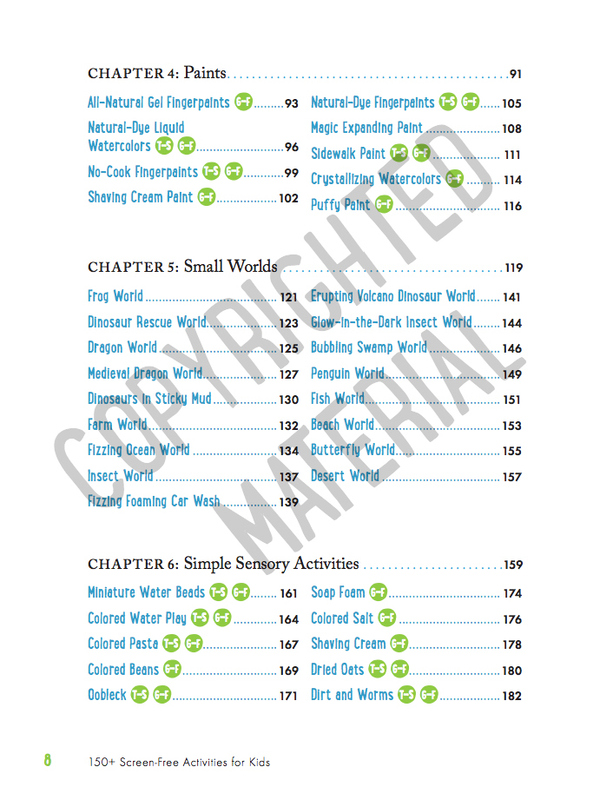 You can see a listing for each of the main activities here in the Table of Contents! If you'd like to see a full listing of all the activities, you can view the full index via the Amazon Reader if you are on a desktop computer! Since I am sharing not-yet-released copyrighted material, please note that you may not share these images on your site, nor may you pin them. Please feel free to share and pin either of the cover images above instead. The next most common issue my friends had was a suuuuuper long list of supplies. I created a "quick start" list of 15 materials that are all easy to get your hands on (ideally you'll be able to get them all at your local superstore like Target or Walmart). Honestly most people have several of the items on the list in their house already. 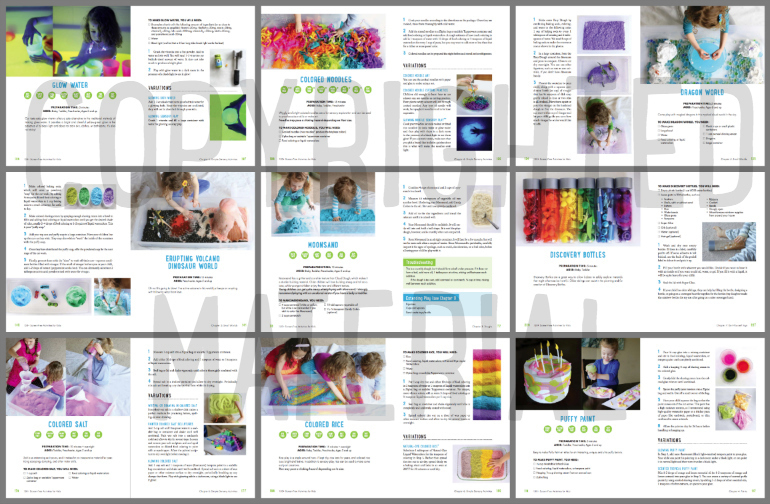 With these 15 materials you can complete nearly half of the activities in the book. 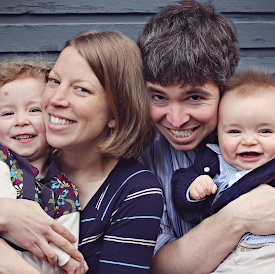 The final most common complaint about activity books from my friends was a lack of photos. I've got you all covered here! 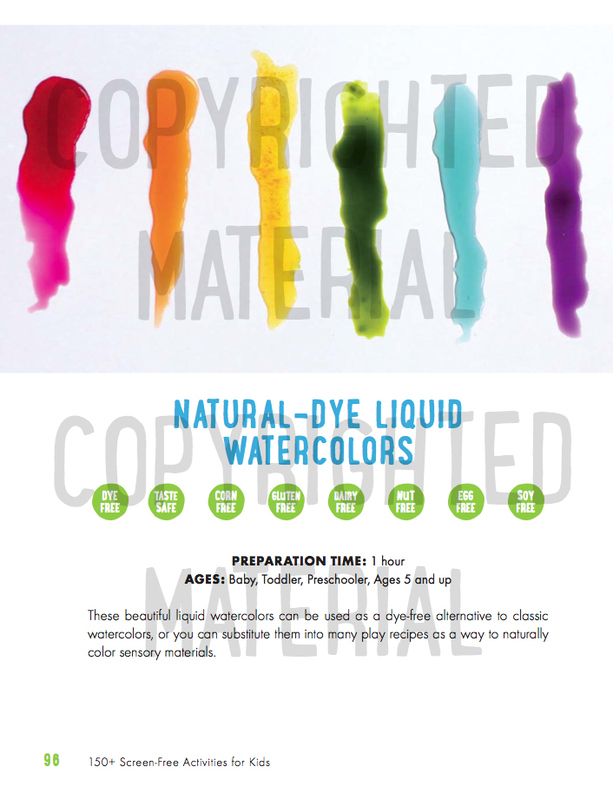 There are over 300 full-color photos illustrating the finished products as well as the steps and possible variations for the activities in the book. I don't actually know how the designer in charge managed to fit them all - I think it involved a little magic - but this is probably one of the most photo-dense activity books you'll find. The activities in this book have - no joke - entertained my two kids for the past two and a half years (and S for two years before that!). Because they are so open-ended, they are highly repeatable; there are also lots of ideas for ways to vary the activities to make them seem new again. 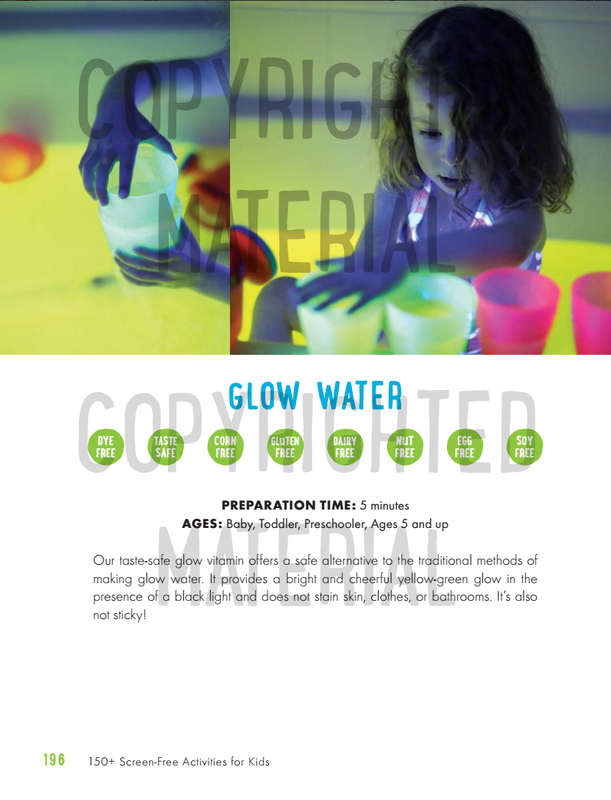 As you'll see below, all of the sensory activities and recipes are allergen-coded and any activities that are taste-safe are also noted under the title. Each activity has an approximate preparation time noted. I made an effort to keep the vast majority of the activities at or under a prep time of 10 minutes, but there are a handful that require more time (they're really cool though). I've also noted suggested ages for each activity - each child is different, of course, and you know your child's abilities and interests best, but it should give you an idea of what activities may appeal to them. 1. If you pre-order through Amazon, you'll get a smokin' deal. Amazon pricing can change hourly (isn't that crazy? ), but they have a Preorder Price Guarantee. That means that no matter what the price is when you order it, if a better price comes along before the book ships to you, they'll refund you the difference. Pre-ordering it now means you have several weeks of price variations ahead and you will get the very lowest price of all of them! 2. You get the book EARLIER. Yep. 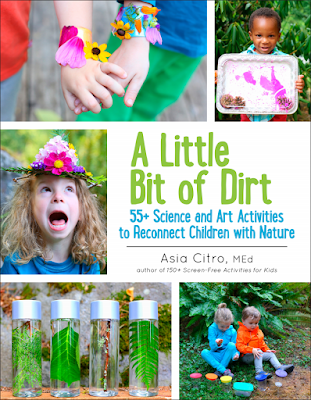 The latest news from the publisher is that the book could be ready as early as mid-October. It ships out to Amazon FIRST and they fulfill their preorders immediately. No one knows the exact ship date until it happens, but at least right now, there's a very good shot you'll have your copy of the book up to two weeks before it's in stores - how cool is that?? 3. Preorder numbers matter to retailers. Several bookstores and retailers are watching my book right now (eeeek!) to see how many presales come in. Books that have more presales are taken more seriously....basically if you guys show them that this book rocks with presales, it's WAY more likely to be widely available in stores. Ohhh, it looks so amazing! Your book is going to be on so many holiday wishlists! Congratulations! It looks fabulous, I can't wait! What a great preview! Looks like an amazing book! I'M SO EXCITED! I preordered through Amazon. CAN'T WAIT! Oh Asia, It looks so beautiful!!! I am so excited to get my copy! Thanks for all of your hard work! This looks so great! 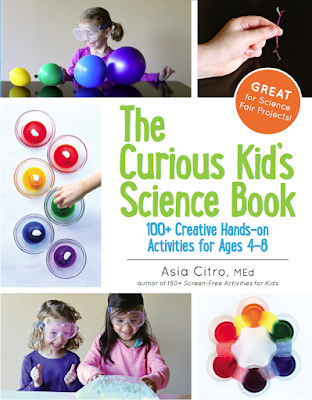 I'll definitely be ordering and using this book often for my own little ones and Learning by Design customers. Congratulations!!! How exciting for you Asia! Can't wait to read and be inspired by for my kids. Would love to set up a Hangout On Air with you to discuss your book if you're interested. I get to excited to see authors sharing topics that they are passionate about and enjoy sharing with others! The book looks wonderful. Great for in a Christmas basket with some supplies. I love the look of the book layout. Congrats! What a great looking book! 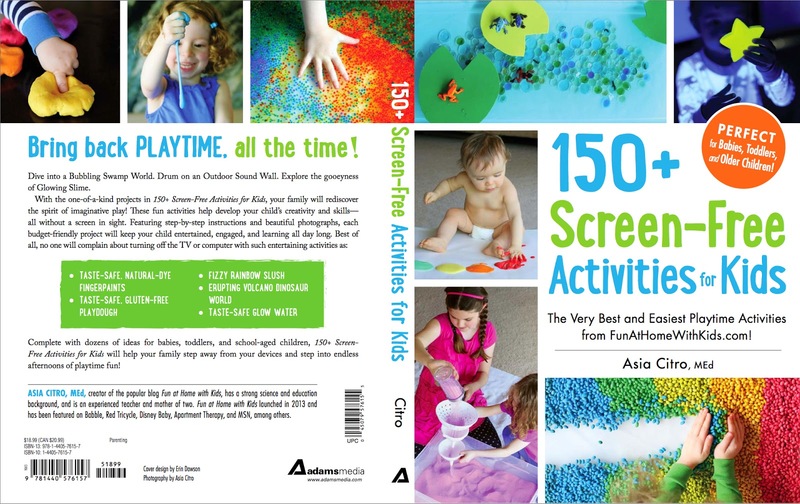 Asia, can you tell me about what age ranges the activities are for? Thank you! I was actually thinking of finding a way to print out one way or another all the good ideas coming from your blog (and others too) because I'm a paper lady that still needs to flickr through pages, underline etc.so a book is a perfect answer to this. I live in France and would be happy to pre-order the book and to offer it too after that. So I don't know if that will be possible. I'll wait until it is out and will order it online then otherwise. Thank you so much! Yes, the book makes it all SO MUCH easier to flip through. I am a book person, too, so I am super excited! You can preorder it right now through Amazon France: http://www.amazon.fr/150-Screen-Free-Activities-Kids-Playtime/dp/1440576157/ or there are likely several other sites (if this one isn't a good deal, but I think it is) in France that are offering it for preorder right now as well. I think that overseas, the book comes out a few weeks later, but it should be sometime in November!!! Thank you! Ah perfect, thanks I thought it was limited to your initial list... I didn't even check on Amazon France :shame: I will place an pre-order then. I'm so excited for you Asia! I'm going to preorder a stack of these and put together little sensory kits to go with! Christmas is done! YAYY! Thank you so much for the preorder and YESSS we can hardly wait either!!!! Hopefully you will get it a few weeks sooner than they estimate - my fingers are crossed!!! I just preordered mine! My 19 month old is just starting to enjoy getting his hands dirty, and inexpensive, easy projects like yours are perfect for him. Thank you! Just pre-ordered it! Can't wait to get it. I stumbled on another blog that was featuring this book and bought it on a "whim" which is rather rare of me - but the post sold me on it. When it arrived it far exceeded my expectations! I have my shopping list ready and can't wait to get some of the items. We've already enjoyed the water activities and it's really opened up my mind for creative play. Very inspiring and awesome to see my daughter explore - can't wait for the years to come with her and my son. Thanks! Hi Asia! I've just ran into your blog and I loved it! Im from Perú, where can I buy your book?? Is there any spanish version? or any way I can pay for a digital one? Thank you very much! I'm a kindergarten teacher.... I just got your book in the mail and read it cover to cover. I am so excited to try every single activity with my students! I may also buy a copy for every parent I know. You are the coolest mom ever, thank you for writing this!!! love this book! when is out in the uk?